Original watercolor/acrylic painting 19″ x 30″, “Sweet Repast” SOLD. 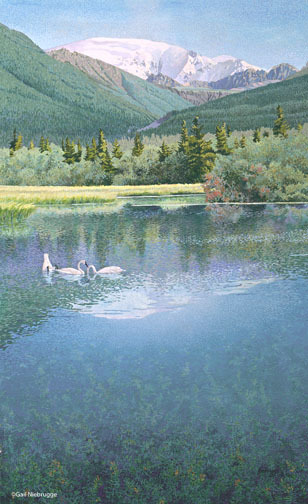 The elegant Trumpeter swans quietly forage for food and preen themselves in the reflection of Mt. Blackburn in the Wrangell-St. Elias National Park, Alaska. This pastoral scene is located at the base of the mountains near the long winding dirt road from Chitina to Mc Carthy. This open edition art print is of the highest quality, printed on acid free paper with fade resistant inks, each are hand-signed by the artist Gail Niebrugge. A larger version limited edition of this image is totally sold out, to see it click here.